Andorra is a tiny country nestled on the border between France and Spain with a population of around 75,000 (UN Estimate 2007). 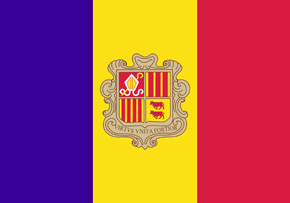 Its official name is the Principality of Andorra, or in Catalan, Principat d'Andorra. 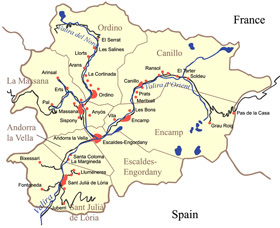 Andorra is divided into seven parishes which are Andorra la Vella, Canillo, Encamp, Escaldes-Engordany, La Massana, Ordino and Sant Julià de Lòria. Soldeu is in the parish of Canillo. There are three main resorts which attract tourists for mountain holidays in Andorra. These are Soldeu, Arinsal, and Pas de la Casa. Soldeu and Pas de la Casa are part of the large Grandvalira ski area and Arinsal is part of the Vallnord ski area. Andorra has one of the highest life expectancies in the world at 83 years. The fresh mountain air and excellent healthcare system will no doubt be key contributors to this statistic. The official language of Andorra is Catalan, however Spanish and French are widely spoken and English is usually understood. Andorra is the only country in the world where the only official language is Catalan and they are very proud of the heritage and traditions. Andorra does not have its own currency therefore it has always accepted the currencies of Spain and France; until the Euro was introduced both the Spanish Peseta and French Franc were used. Until very recently Andorra was not technically in the Eurozone, however they still used the Euro as their currency. In 2014 and after long negotiations Andorra became an official member of the monetary union and Andorran Euro coins were issued. You do not need a visa if you are travelling to Andorra from the UK or Ireland, however you should make sure you have your passport with you and it is recommended that it is valid for at least six months after you travel. If you are coming to work in Andorra you will be required to apply for a work permit. There are customs on entrances to Andorra from both Spain and France and all vehicles can be stopped and searched. As Andorra is not part of the EU the amounts of certain goods allowed out are restricted.